Army takes Operation Crocodile Smile III to market, streets in Delta. 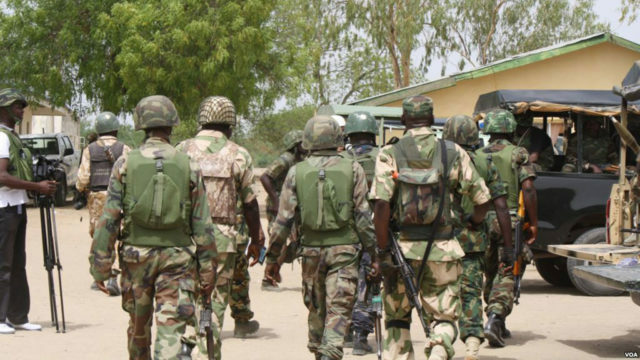 Home » Naija news » Army takes Operation Crocodile Smile III to market, streets in Delta. The Nigerian Army has taken the Operation Crocodile Smile III exercise in Delta State to the popular Effurun Market and some major roads in Uvwie Local Council of the state on environmental sanitation mission. The soldiers, assisted by youth corps members, also moved through the ever-busy PTI and the Warri-Sapele roads and cleaned out dirty gutter and removed trashes that littered the roads. Grema, who explained that environmental sanitation was part of the Operation Crocodile Smile III and that after being through with Warri and Effurun areas, the exercise would be replicated in Sapele and Ughelli, said the army would also embark on educational outreaches where educational materials would be donated to selected schools in the state. He, therefore, urged the youths to eschew violence by getting involved in positive activities that would lessen tensions in Uvwie Kingdom.In another development, the Nigerian Army Corp of Artillery has commenced the sixth edition of the yearly exercise Vulcan Glow to enhance pro-activeness and boost the fight against insurgency in the North-East and the country at large. Commander, Nigerian Army Corp of Artillery, Maj.-Gen. Abubakar Tarfa, who spoke with journalists after the inspection of the site at Gindin Dutse in Kajuru, a community in Kaduna State, said the exercise, when concluded, would enhance the performance of troops deployed for operations within and outside the country. Related : Army takes Operation Crocodile Smile III to market, streets in Delta.